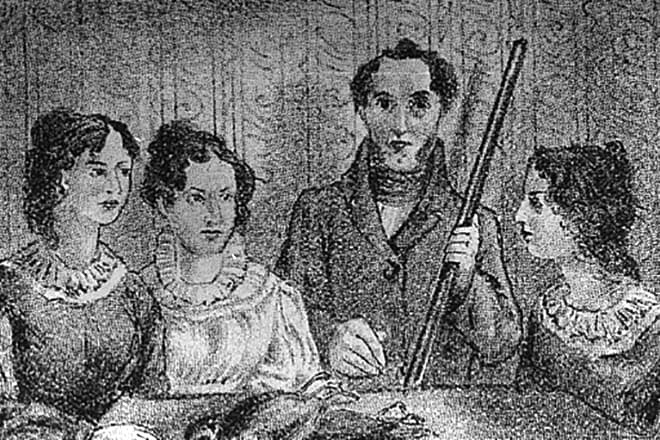 People often forget that Anne Bronte had a brother as well as sisters. Branwell was actually considered to be the talented one in the family and they expected great things from him. Patrick Bronte hired an art teacher specifically to help to nurture Branwell’s t alents. There were also hopes that he would become a successful poet or journalist. However, when he went to London to attend the Royal Academy Schools, he never showed up there. He simply spent his time wandering around London’s streets and spent his money on alcohol. Stints as a portrait painter and a railroad worker also failed. Charlotte helped to arrange a position as a tutor for him with her employers, the Robinsons. Charlotte acted as a governess for the family and when the son became too old for her to teach Branwell was hired. However, this also failed. He conducted an affair with his employer’s wife and while it is widely believed that she was the instigator of the relationship, Branwell was blamed and dismissed. After he left the Robinsons he started to drink more heavily and became depressed, dying at the early age of 31. However, the three remaining siblings were having much more success. They had published novels and poetry. Charlotte was the author of ‘Jane Eyre’, ‘Shirley’, ‘Villette’ and ‘The Professor’, although the latter was only published after her death. Emily published ‘Wuthering Heights’ in 1847 and Anne was the author of ‘Agnes Grey’ and ‘The Tenant of Wildfell Hall’. Initially they published under the pen names of Acton, Currer and Ellis Bell as they believed that as women they would not get a fair chance in the literary world. Emily died of tuberculosis in October 1848 and Anne died of the same disease the following year. Charlotte married the Reverend Arthur Bell Nicholls in 1854, but Charlotte died the following year, of the same condition that had taken all of her sisters.